...in Latin means "do as you please". It is also the motto of one of my favourite places; Hambleton Hall. We like those kind of days best. I know I have posted about this before but our linky lonky days are very comme ci, comme ca and we go with the flow and we cherish them. It all began with Hubster's excellent bacon & egg muffins on the barby. Eat your heart out Macca's. Hubster then had some chores to do so I went and did a session at the gym. We set out on our bikes and the beachfront was buzzing because today is a public holiday. It was a hard ride into the wind but bracing and refreshing. We got lost in the menu of a great tapas bar called Lost. Tapas is perfect for such days, a bit of this, a bit of that and whatever else takes your fancy. The platters look huge in the photos but they were sharing/nibble size, we then settled down to some acoustic tunes in the bar. The cycle back is always tough with a replete tummy but we found our sofa for cuddles a trois with some 20/20 cricket before slumber. We did as we pleased. Australia Day is on 26th January every year. This year it fell on a Saturday so it is more of an Australia Weekend. We kicked our weekend off on Friday night with a bit of Elvis Costello, he was brilliant. On Australia Day the nation comes together to celebrate being Australian. Simple as that and I love that idea, as a Brit I envy the fact we don't have such a day. The atmosphere everywhere was wonderful, camaraderie, friendship and goodwill filled the air like a rosy glow. You could feel it and it was infectious. Historically it commemorates the anniversary of the arrival of the First Fleet of 11 convict ships from Great Britain, and the raising of the Union Jack at Sydney Cove by its commander Captain Arthur Phillip, in 1788. The indigenous Aboriginal people call this day, Invasion Day and history would say that justifiably they have little to celebrate. On Australia Day, over half of the nation’s population of 21 million attend either an organised community event, or get together with family and friends around the barbecue. Yet the day is so much more than barbecues and fireworks. On this day all those who have been granted citizenship are officially sworn in. It is a day of great pride and excitement and I would imagine the oath that is taken is a very emotional experience for all those who can then finally call Australia home. In Melbourne 80 new citizens were sworn in at the City Hall. We went down to the Australia Day Big Swim at Brighton Beach just minutes from home. It was really exciting with over 850 competitors, live music, stalls and of course "snags" (bangers) on the barby and lots of flag waving. Then we watched the ladies Open tennis final with hot dogs and wine. The celebratory fireworks stopped play for 10 minutes and Azarenka won. Another weekend in Melbourne and yet another major event. This city is a constant host to some of the most prolific sporting and entertainment events in the world. It is just so perfectly set up for it and unlike cities like London, New York, Paris which are huge and rambling, Melbourne is actually tiny in comparison. The hub of it all is concentrated over a few wee kilometres making it incredibly easy to access as much or as little as you want. It was absolutely on my must do list to come to the Australian Open. Just 20 minutes from home and one easy train ride in. The Open is always held in Melbourne and is known widely as the player's favourite tour on the circuit. The reason being is that it is so relaxed, the atmosphere is fun and all around the arena are side shows and music, huge picnic areas and pop up shops. Melbournians tend to be very unstarry about celebrities, they are left on the whole to wander around the city totally undisturbed and they seem to appreciate this. It's kind of uncool to show them too much attention. The Rod Laver Arena is the equivalent of Centre Court at Wimbledon, where the big action takes place and Hubster managed to hoover up the last couple of tickets for us. You never know how the draw is going to go but we were chuffed to pieces when we realised we would see 3 matches starring Victoria Azarenko (last year's open champion), Serena Williams and Andy Murray. It was a gorgeous 23 degrees with a light breeze. We were in the shade and our picnic was packed. The arena was impressive and much smaller than it looks on TV. It was a totally thrilling day of tennis and once again another experience in Melbourne I will never forget. Thank you Melbourne, I know why you are classed as one of the best cities in the world to live. Our time here is relatively short and will go quickly but we already know in years to come we will look back and say Wow, we had a ball! Until then we will just keep rolling with the waves and soak up as much as we can. Radders didn't miss out and on our return loved his giant tennis ball pressie. It was the last day of Hubster's lovely, long Christmas break. It's been so good having him around and he did some great "needs-a-man" jobs during the time off too! On Monday, we decided to minimise that "back to school" feeling and get out and about. A most gorgeous 30 degrees and we headed towards Mornington but not to the coast like everyone else. Forever shy of crowds, we drove into the beautiful country side to find it was peaceful and quiet and traffic free. We virtually had the vineyards to ourselves. We spent a linky lonky day, pottering here and there and found a super spot for lunch with beautiful views. We dined at Salix, a restaurant at Willow Creek winery and thoroughly enjoyed a platter of smoked ocean trout. As ever a few wee bottles were purchased to replenish a few gaps in the wine rack. Pink Claw by the Yabby River Vineyard. Delicious and light and $5 from each bottle sold goes to the Breast Cancer Foundation. Well worth buying half a case then. This was our last day of indulgence for the morrow would bring modest consumption in all manner of things and exercise would be stepped up once more. All in all we really did make the best of the break and had a great time a deux and with our boy. I admit I am not a huge fan of watching cricket on the TV unless it is the Ashes or a nail biting test match. Going to see it live is a different matter. The MCG sends tingles down your spine whenever you enter the arena. It just has that special stadium feel where you know incredible things happen. 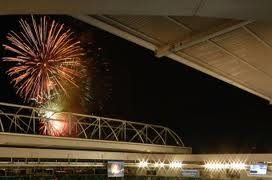 On Sunday night it was the Big Bash 20/20 cricket, Melbourne Renegades v Melbourne Stars. Fierce rivalry on the pitch was assured and delivered. We were supporting the Stars captained by Shane "Warney" Warne of Liz Hurley fame! The atmosphere was incredible and felt more like we were attending an American baseball match than a cricket one. The Collective, runners up in the Aussie X Factor had all the girls screaming, there were pyrotechnics a plenty and sparkly cheerleaders frantically pumping their pom poms to acrobatic routines. The commentator was rousing the crowd with the "Fan Cam" and the "Kiss Cam" and the crowd responded with rendition after rendition of the mexican wave. The drama on the field was also full on. Samuels from the Renegades pulled the shirt of one of the Stars batsman to try and stop a run. Warney on the bench got a right strop on which he brought to the field with him and some finger pointing and terse verbals were exchanged. Then Warney threw a ball at Samuels and Samuels petulantly launched his bat into the air! Girls girls this just isn't cricket! The crowd went berserk of course and loved it! Soon after Samuels copped a deflected ball off his bat which hit his face guard at a blistering 140kmph. He retired from play with a fractured eye socket. The Stars were hammered by the renegades, 6's and 4's were flying every where and Warney's boys had no response to the onslaught. It was a record crowd for the Big Bash 20/20 so far, 46,851. We all made some noise and we all had a great night and it certainly was a Big Bash!